Wyrd Chronicles Vol. 36 is now live! Break on through to The Other Side. Comparing Malifaux & The Other Side: An in-depth look at the differences and similarities in our two miniatures games! Storming Into the Breach – Starting the Other Side: Interested in The Other Side but don’t know which Allegiance to pick or what you want in your Company? Let’s give you a hand. Little Star: A mother and daughter down on their luck as a mysterious light appears over London. Painted Model Gallery: A close-up look of some of The Other Side’s fully painted models. The Other Side – Battle Report: The Cult of the Burning Man and the King’s Empire duke it out in a play-by-play breakdown of The Other Side. Lost at Sea – The Other Side Scenario: An Abyssinian destroyer gets bombarded by an unknown enemy. Can you survive the Hordes? 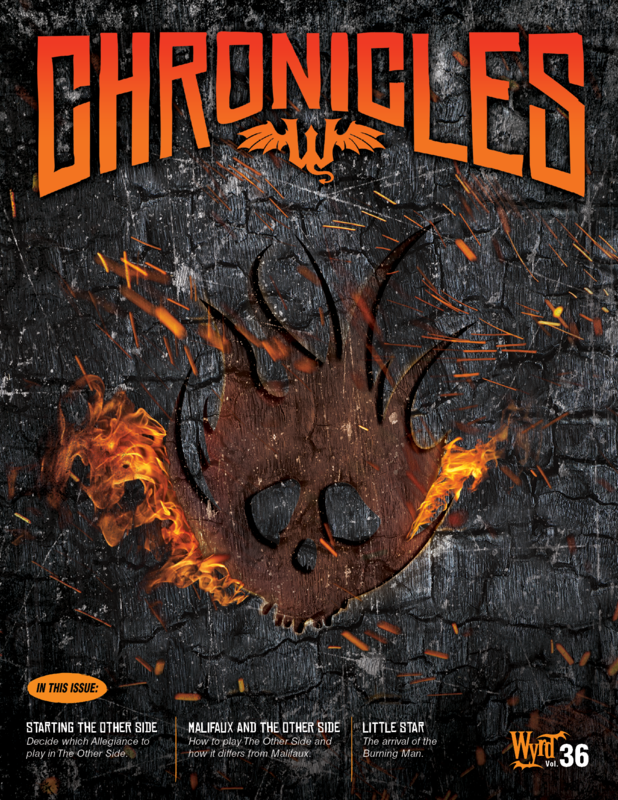 You can find the latest issue of Chronicles for the low cost of FREE on DriveThruRPG! A whole issue dedicated to TOS is a nice surprise, and the articles are really good. So i just finished reading the issue, and even though i won't get into the game right now, i'm really impressed by TOS overall. Love the lore, and the game mecanics, presented in the first article as well as in the battle report, feel very solid. Straithforward and deep, this seems actually very refreshing rules. Last but not least, the business plan is smart. It seems that Wyrd understood that releasing new models for the same factions always end up by overcrowding it. Players then see that this one early released model has been outdated by this new one (we can see this in Malifaux). It results a lot of "dead models" and fewer diversity in builds, and of course some models are left unsold forever at some point. So what do they do? They wanna release new factions! Gives ways to explore new gameplay mecanics, as a faction should not feel like any other, and you can give new players a way in any time you do this, because number of models per faction will remain low, so not too hard on the wallet, and new faction says new theme, so if you've not been in love with an existing faction, you could with a new one! I think it's a very intersting move, don't you? It's a good idea. It lets them keep armies thematic, while using mercs/infiltration type mechanics to let you bring some other units in. Bring a dual commander, take some models from the other allegiance. And hey, while you're there, you might like it enough to grab that allegiance. Smart from a balance perspective and a marketing one. Though I'm guessing they're going to toss each existing army the odd unit per book to keep interest going. There's going to be people who want to stick to a certain army, and not supporting that at all will lose customers over time. I'm glad people liked the articles The prize for the Obsidian Gate event is a new Adjunct model for someone, so it seems like there definitely will be some new stuff from time to time (and a dual-Allegiance Commander is inherently a new model for that Allegiance too), but I agree that this is a really solid business plan. It also makes things way easier to balance, since you can only have one Envoy so you only have to worry about balancing new things in the Allegiance's pairs. It’s always exciting to have a new issue be released. Getting an issue that had no Malifaux content in it is a bit of a let down. Different games. The changes made in TOS were to get 50-60 model games played in a shorter time. As a skirmish game it’s expected that Malifaux has a bit more complexity. Speaking as someone who played first edition, they already have simplified malifaux with some of these concepts. I think it survived ok. The depth of malifaux is not based on the complexity of the rules.